Proportional Temperature Controller (PTC03) with low noise performance. Available separately. This slice recording chamber is based on the BSC1 and BSC2 chambers with both “interface” and “submerged” methods of maintaining slices. 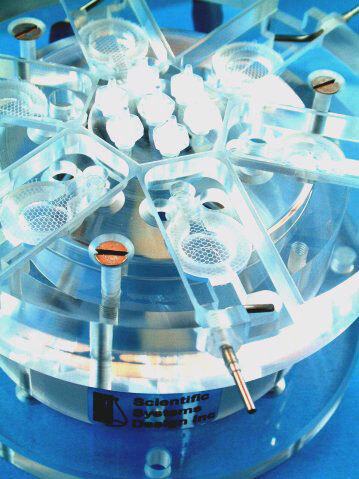 Four and six separate chambers are machined on one acrylic block for simultaneous perfusion with four or six separate solution lines. As with BSC1 and BSC2 the temperature is controlled by a proportional heating unit, the PTC03. Please order this item separately. 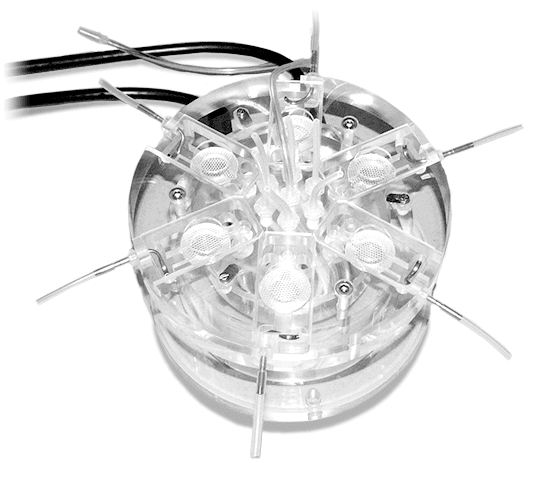 The chamber is constructed from clear acrylic having a diameter of 130mm, overall height is 70mm and the base plate is 130mm in diameter. The slices rest on a nylon net held in place by a close fitting removable insert. Pre-oxygenated medium enters the main body of the chamber through a fine bore tube which spirals in the heated distilled water in the lower part of the chamber and enters the upper part of the chamber directly into the feed for each of the four or six chambers. Depending on whether submerged or interface type preparations are required, the height of the perfusion fluid is adjusted at the exit well by means of a variable angle stainless steel needle as with our MS-1 chambers. In the case of interface preparations, the high oxygen tension is maintained by bubbling a 95% oxygen, 5% carbon dioxide gas mixture through a sintered bubbler located in the lower heated part of the chamber. This moistened and warmed gas mixture enters the upper part of the chamber via “port holes” and is then deflected by a standard rectangular glass coverslip across the centrally located slice preparation. The temperature in the upper chamber is maintained by ensuring that the medium and moistened gas mixture enter at the required temperature. This is dependent on the temperature of the lower chamber body which is warmed by a heating element controlled by the Proportional Temperature Controller, PTC03.